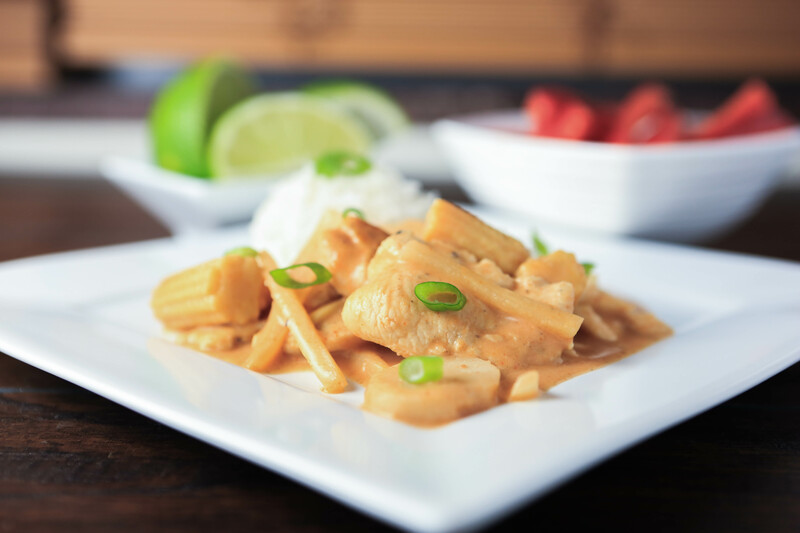 Tender bites of chicken surrounded by baby corn, crunchy water chestnuts, and bamboo shoots, covered in a light coconut peanut curry sauce. This recipe brings “take-out” from your stove to your table. Do you remember the movie LOL starring Miley Cyrus? Well, honestly the only reason that I was excited to see it was because they filmed parts of it in my hometown and at my old high school! I wasn’t the biggest fan of the movie (it was horrible), but I did love seeing the old hallways and classrooms of my high school. It’s not everyday they film a movie in your hometown, or at least mine. While they were here filming, the word around town was that Miley Cyrus visited our favorite Thai restaurant TWICE while she was here! If Miley likes it, it must be good! (lol) But honestly, Andrew and I have had a number of great meals there, and of course found a family favorite that we all seem to go back for. Our favorite there is the “Curry Peanut with Chicken”. 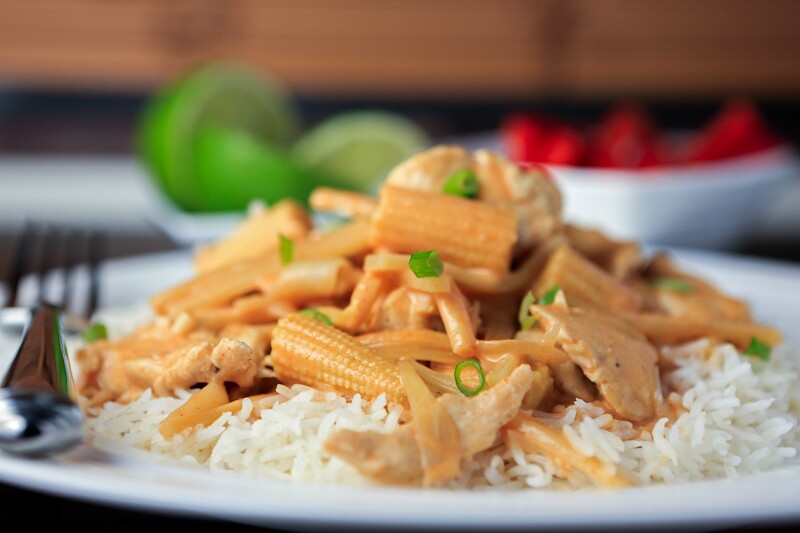 It has chicken, baby corn, water chestnuts, and bamboo shoots in a peanut curry sauce. It’s pretty darn delicious. It became such a hit around here that one day I decided to put my chef’s hat on and get creative. I mean, why not try and create your favorite restaurant meal at home? I have been working on perfecting this recipe for a while, and now I am finally happy with it! I just made this again the other night and we devoured it. The boys even loved it too. The peanut butter, curry and coconut sauce combined with the chicken and variety of veggies really make this dish something special. Slice chicken breasts very thin, into strips about 1/4" thick. Put in bowl and toss with salt and pepper, and let sit at room temperature for about 30 minutes. Rinse, drain, and cut water chestnuts, bamboo shoots, and baby corn as mentioned above, and combine in a small bowl and set aside. In a medium sauce pan, heat coconut milk, curry paste, peanut butter, sugar, and fish sauce over low heat until they come to a very small boil. Set aside and cool for a few minutes, then whisk in the cornstarch to thicken. In a large non-stick frying pan, heat 1 teaspoon of the oil until hot, then add the onion and cook until softened but not browned, about 2 minutes, then stir in the garlic and cook until fragrant, about 30 seconds. Remove onion and garlic from pan, into a clean bowl, and set aside. Using the now empty pan, heat the remaining 2 teaspoons oil, and then add the chicken and stir-fry until cooked through. Now add the water chestnuts, bamboo shoots, baby corn and onion and garlic to the chicken mixture. Stir together and warm for about 2 minutes. Then add the sauce and stir, and heat for a few more minutes until everything is hot. Serve over white or brown rice.